We are the largest independent producer of coke in the U.S., currently supplying approximately 4.2 million tons to the nation’s leading integrated steelmakers. We have domestic cokemaking facilities in Virginia, Indiana, Ohio and Illinois, and international operations in Vitória, Brazil, and Odisha, India. You can learn more about the coke plants on our Facilities page. Coke is a key ingredient in steel production. It’s made by heating metallurgical coal in large-scale, specially-designed ovens to more than 2,000 degrees Fahrenheit for about 48 hours, which leaves behind a carbon-rich product called coke. The coke is shipped to a steel mill where it’s mixed with iron ore and other elements, like limestone, and heated again in a blast furnace as part of the steel-making process. Our advanced technologies produce high-quality coke and capture waste heat to generate power and reduce environmental impacts. 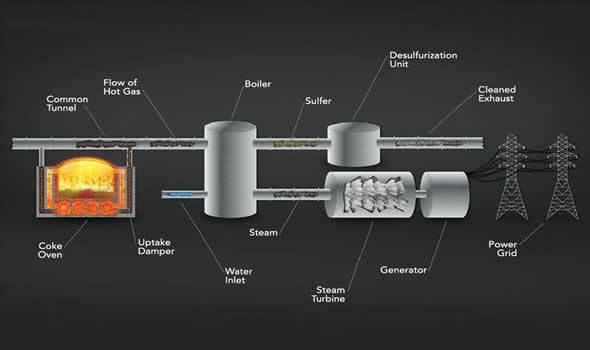 In our heat-recovery process, gases released from the coal are thermally destroyed inside the coke ovens, and sole flues and hot gas ducts provide sufficient temperature and turbulence to eliminate virtually all organic compounds.